Background: Tongue thrusting habit is a condition in which the tongue makes contact with any teeth anterior to the molars during swallowing. Abnormal positioning of tongue may result in dental and skeletal abnormalities. Objective: The aim of the present study was to study and compare soft-tissue, dental, and skeletal morphologic characteristics in children with and without tongue thrusting habit. Materials and Methods: A total of 21 children with tongue thrusting habit and 21 children without any habit between age 10 and 14 years were selected for the study. Various soft-issue, dental and cephalometric parameters were measured and compared statistically. Results: Significantly, higher number of children with tongue thrusting showed lip incompetency (86% vs. 14%), mouth-breathing habit (38% vs. none), hyperactive mentalis muscle activity (24% vs. none), Open-bite (52% vs. none) and lisping (86% vs. none) when compared to children without tongue thrust. Children with tongue thrust showed increased upper lip thickness and proclination of maxillary incisors No differences were found in angulation of mandibular incisors, inter-premolar or inter-molar widths and all the skeletal parameters studied. Conclusions: Tongue thrust seemed to affect some of the soft-tissue and dental characteristics causing lip incompetency, mouth-breathing habit, and hyperactive mentalis muscle activity, lisping, open-bite, and proclination of maxillary incisors; however, no significant skeletal changes were observed. Background: Transition of the normal oral epithelium to dysplasia and to malignancy is featured by increased cell proliferation. To evaluate the hypothesis of distributional disturbances in proliferating and stem cells in oral epithelial dysplasia and oral squamous cell carcinoma (OSCC). Aim: To evaluate layer wise expression of Ki-67 in oral epithelial dysplasia and in OSCC. 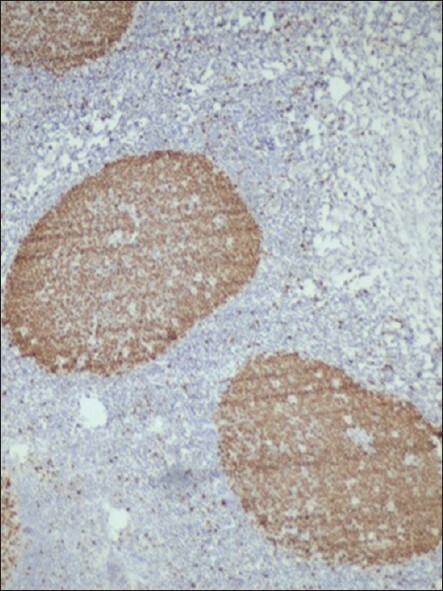 Materials and Methods: Thirty histologically confirmed cases of oral epithelial dysplasia, fifteen cases of OSCC and five cases of normal buccal mucosa were immunohistochemically examined and nuclear expression of Ki-67 was counted according to basal, parabasal, and suprabasal layers in epithelial dysplasia and number of positive cells per 100 cells in OSCC as labeling index (LI). Results: Suprabasal expression of Ki-67 increased according to the severity of epithelial dysplasia and the difference was statistically significant ( P < 0.001). The mean Ki-67LI was 12.78 for low risk lesions, 28.68 for high risk lesions, 39.45 for OSCC and 13.6 for normal buccal mucosa. Conclusion: The results of the present study demonstrate the use of proliferative marker Ki-67 in assessing the severity of epithelial dysplasia. Suprabasal expression of Ki-67 provides an objective criteria for determining the severity of epithelial dysplasia and histological grading of OSCC. 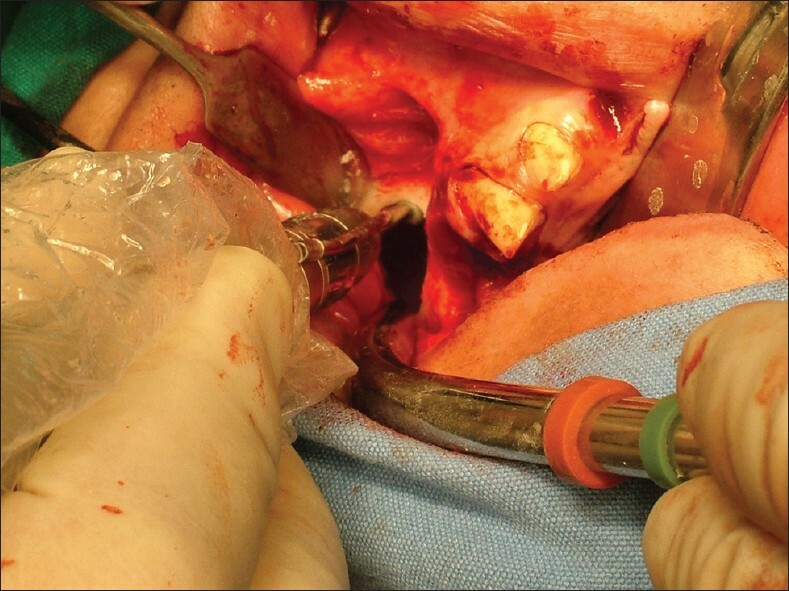 Purpose: This article reports the clinical outcomes observed in a large number of patients receiving block bone allograft used for sinus augmentation and delayed implant placement. Patients and Methods: In total, 28 patients (13 males) with a mean age of 49.8 ± 10.1 years (range: 33-67 years) were included in this case series. All selected patients suffered from severe alveolar ridge atrophy in the posterior maxilla and required bone augmentation procedures, followed by implant placement after 6 months. All patients were followed for 18 months after the grafting, with scheduled monthly visits and/or more frequent visits if required. The survival rates for both the bone blocks and placed implants were then evaluated. Results: A total of 42 blocks and 90 implants were placed. Only one bone graft and 5 implants failed; the survival rate was 97.2% and 95.5% for the bone grafts and implants, respectively. The graft failed due to the onset of post-surgical infectious sinusitis, while in some patients' implants showed absence of osteointegration at the end of the healing phase. Of note, all failed implants were observed in heavy smokers; in all other patients, blocks and implants were successful. Conclusions: This preliminary case series suggests that the grafting of bone allograft followed by delayed implant placement may be a promising strategy for sinus augmentation. More extended and larger follow-up studies are needed to confirm this preliminary data. Context: Early observations of enamel surfaces prepared by erbium lasers motivated clinicians to use laser as an alternative to chemical etching. Aims: Evaluate shear bond strength (SBS) values of different dental adhesives on Erbium:Yttrium Aluminum Garnet (Er:YAG) laser prepared enamel and to evaluate possible etching patterns correlations between dental adhesives and SBS values. Subjects and Methods: One hundred bovine incisors were randomly assigned to SBS tests on enamel (n = 15) and to enamel morphology analysis ( n = 5) after Er:YAG laser preparation as follows: Group I - 37% phosphoric acid (PA)+ ExciTE® ; Group II - ExciTE® ; Group III - AdheSE® self-etching; Group IV - FuturaBond® no-rinse. NR; Group V - Xeno® V. Teeth were treated with the adhesive systems and subjected to thermal cycling. SBS were performed in a universal testing machine at 5 mm/min. Statistical Analysis Used: One-way ANOVA and post-hoc tests (p < 0.05). For the morphology evaluation, specimens were immersed in Ethylenediamine tetraacetic acid (EDTA) and the etching pattern analyzed under Scanning Electron Microscope (SEM). Results: Mean bond strengths were Group I - 47.17 ± 1.61 MPa (type I etching pattern); Group II - 32.56 ± 1.64 MPa, Group III - 29.10 ± 1.34 MPa, Group IV - 23.32 ± 1.53 MPa (type III etching pattern); Group V - 24.43 MPa ± 1.55 (type II etching pattern). Conclusions: Different adhesive systems yielded significantly different SBSs. Acid etching significantly increased the adhesion in laser treated enamel. No differences in SBS values were obtained between AdheSE® and ExciTE® without condition with PA. FuturaBond® NR and Xeno® V showed similar SBS, which was lower in comparison to the others adhesives. No correlation between enamel surface morphology and SBS values was observed, except when PA was used. Background: This randomized, controlled clinical study was planned to evaluate the use of anti-inflammatory drug flurbiprofen in the form of locally delivered controlled release gel in the treatment of periodontal disease. Materials and Methods: The flurbiprofen gel was indigenously prepared in the concentration of 0.3%. The 30 patients with localized periodontal pockets measuring ≥5 mm were randomly divided into three groups. The groups received flurbiprofen gel, flurbiprofen gel after prophylaxis, and placebo gel after oral prophylaxis, respectively. The clinical parameters for plaque and gingival inflammation were evaluated at baseline, 7 th day, and 14 th day. Results: The results of the study suggested the statistically significant ( P < 0.05) improvement in the gingival status of the patients with the use of flurbiprofen gel as an adjunct to scaling and root planing as compared to oral prophylaxis or gel alone. Conclusion: The data demonstrated that the additional use of local drug delivery of flurbiprofen through gel media enhances the positive effects of scaling and root planing and helps in faster resolution of the inflammation. Purpose: The aim of this study was to report a comparison between the zinc oxide eugenol dressing and plasma rich in growth factor (PRGF) with gelatin sponge in the treatment of dry socket. Materials and Methods: This study comprised of 45 patients of dry socket in the span of one year. The patients were randomly divided into three groups on the basis of treatments: Group A (PRGF with gelatin sponge), group B (zinc oxide eugenol group), and group C (irrigation with sterile saline only). 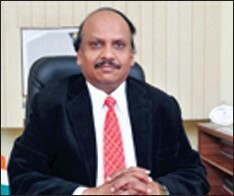 The clinical progress was noted at 1 st , 2 nd , 3 rd , 7 th , and 15 th day after the treatment. Results: Patient's healing was better in group A than in group B but symptomatic pain relief was faster in group B. Group C fared worst in both aspects. Conclusion: We conclude that PRGF with gelatin sponge might be a treatment of choice in the management of dry socket. Context: Facial analysis is the first step in the evaluation of patients with orthodontic, cosmetic, or reconstructive procedures of the face, and one of the most important components of orthodontic diagnosis and treatment planning. It is a well-established fact that human faces differ from one another on the basis of race and ethnicity. The study will provide the aesthetic guidelines to assess the facial discrepancy in Bengali children to develop a proper treatment plan. Aims: To find out the mean values for selective linear measurements on the facial soft tissue of Bengali children, to demonstrate gender differences in the measurements. 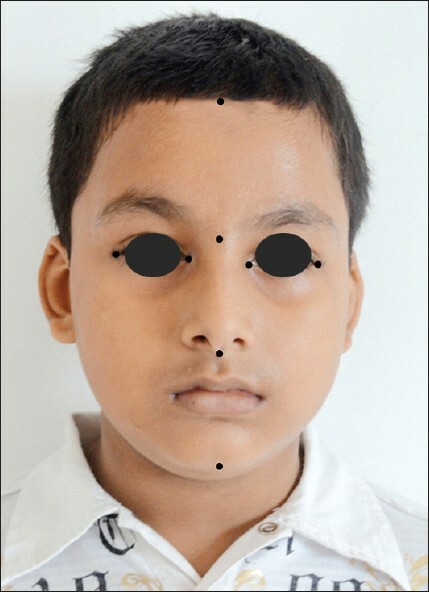 Materials and Methods: A cross-sectional study was done on 250 Bengali children of 6-14 years age, by measuring certain identified facial landmarks using a digital caliper. Statistical Analysis Used: Analytical statistical method with the help of student's t-test was used to determine mean values, standard deviation, and gender differences in the measurements using SPSS version 11.0. Results: In 6-8 years age group, male's average inter-endocanthion distance was significantly higher than that of females ( P < 0.05), whereas in 12-14 years age group, the same parameter for females was significantly higher than that of males ( P < 0.001). In 9-11 years age group, the average distance of exocanthion to exocanthion was higher for males compared to females, but the difference was not significant at 5% level ( P > 0.05), though for 87% of cases, it was significant ( P = 0.13). Total facial height for male subject was significantly high compared to that of females ( P < 0.001) in 12-14 years age group. Conclusions: The study will provide the aesthetic guidelines to assess the facial discrepancy in Bengali children and provide a proper treatment plan through a simple and economically reasonable soft tissue analysis method. Objective: The aim of this study was to evaluate and compare the efficacy of subgingivally delivered Minocycline microspheres and 25% Metronidazole gel when used as an adjunct to scaling and root planing (SRP) in the treatment of chronic periodontitis. Materials and Methods: A randomized, controlled, single center study was conducted involving 60 sites in 20 patients suffering from moderate to advanced chronic periodontitis. Each patient contributed three sites which were randomized to three treatment groups: SRP + insertion of Minocycline microspheres at day 1 (Group A), SRP + insertion of Metronidazole gel at day 1 and at day 7 (Group B), and SRP alone (Group C). Gingival index (GI), plaque index (PI), probing pocket depth (PPD), and clinical attachment level (CAL) were recorded at day 1, 1 month, and 3 months post therapy. Results: All treatments showed significant reductions in PPD and CAL at 1 and 3 months when compared to baseline values ( P < 0.001). At 3 months, sites treated with minocycline showed an additional reduction in PPD of 0.85 ± 0.03 mm, significantly greater than SRP alone. Differences in mean PPD reduction between Group B and Group C and between Group A and Group B were not significant. At 3 months, difference in CAL gain between Group A and C was 0.50 ± 0.45, which was statistically significant and between Group B and C was 0.35 ± 0.11, which was not found to be statistically significant ( P = 0.20). Differences in relative CAL between Group A and Group B were also not found to be statistically significant ( P = 0.53). Conclusion: The results concluded that treatment with Minocycline microspheres and Metronidazole gel improve PPD and CAL in patients with periodontitis compared to SRP alone. Aim : The aim of this study was to evaluate the effects of hyaluronan (HA) and chlorhexidine (CHX) gels as adjunct to scaling and root planing (SRP) in the treatment of chronic periodontitis. Materials and Methods: Sixty patients within the age group of 30-65 years recruited to participate in the study were randomly equally divided into three groups. Complete SRP and subgingival debridement were performed within 6 h in all the patients. For control (Group I) patients, SRP was the only treatment modality given; for Group II and III patients, at least 8 teeth with 4-8 mm probing pocket depth (PPD) were selected for subgingival application of HA gel and CHX gel, respectively. Clinical periodontal parameters such as gingival index, PPD, and clinical attachment level (CAL) were recorded at baseline and 3 months, whereas plaque index was recorded at baseline, 1 month, and 3 months. For measuring systemic/hematological parameters, blood samples for laboratory tests for total leucocyte count (TLC), differential leucocyte count (DLC), and C-reactive protein (CRP) were obtained using standard 2-mL syringe from each subject in all the three groups at baseline, 24 h, and on the 1 month and 3 months post-baseline. Results: In all the three groups, a significant reduction in PPD and gain in CAL were observed between baseline and 3 months follow-up ( P < 0.05); however, at 3 months, change in PPD and CAL was more in Group II than Group III, but the difference was non-significant, and Group I (control) showed less changes in PPD and CAL than both experimental groups. Only one patient revealed positive value for CRP at baseline only, and hence could not be statistically analyzed. In all the three groups, the peak values for TLC count were observed at 24 h. At 1-month and 3-month intervals, a significant improvement in TLC and DLC counts was observed among the experimental (HA gel/SRP and Xan-CHX gel) groups as compared to control group (SRP alone). Background: Micro-organisms are the primary causative agents of endodontic infections. Phenotype based procedures for bacterial identification has certain drawbacks especially, when investigating the microbiota of root-filled teeth. Thus, more sensitive methods like Polymerase chain reaction (PCR) can provide results that are more accurate and reliable for the microbial prevalence in the root filled teeth. Aim: In this study, we have investigated twenty symptomatic root-filled teeth with chronic apical periodontitis for the prevalence of Enterococcus faecalis and Candida albicans in the root filled teeth associated with symptomatic cases with or without periradicular lesions. Materials and Methods: Microbiological samples were taken from the canals immediately after removal of previous gutta percha cones using aseptic techniques. 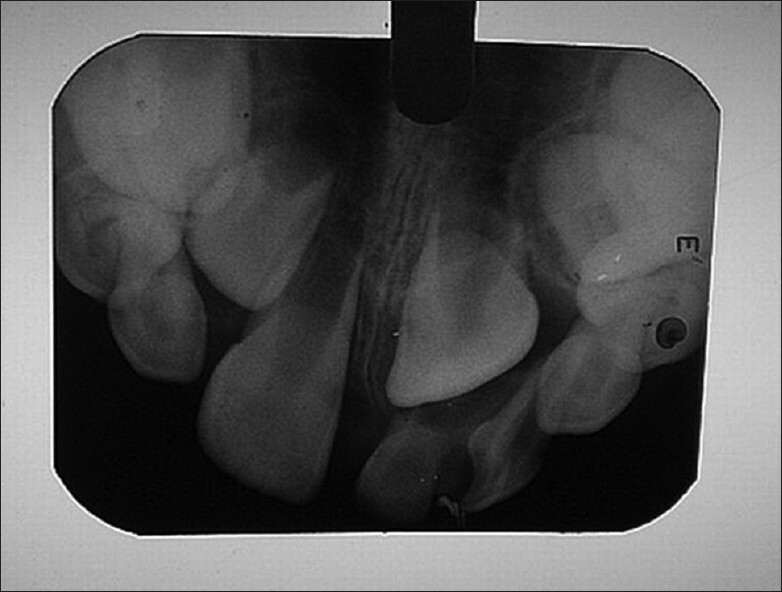 After removal of root canal filling, samples were obtained with paper points placed in the canal. Paper points were transferred to a cryotube containing "Tris EDTA" buffer and immediately frozen at −20°C. 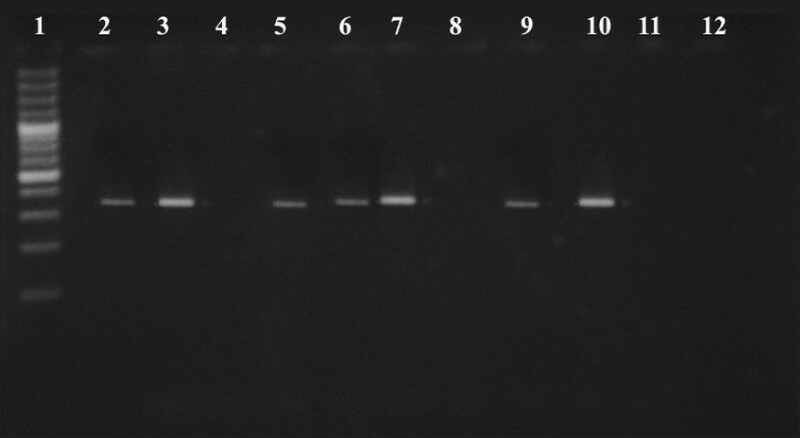 Results: By PCR amplification of the samples using taxon specific primers, E. faecalis was found to be prevalent species, detected in 65% of the cases and C. albicans was detected in 35% of cases. Conclusion: The results of the study shows that geographical influence and dietary factors might have some role to play in the prevalence of the species like C. albicans and presence of E. faecalis confirming the assertion of previous culture-dependent and independent approaches for the microbiological survey of root filled teeth. Aims: The purpose of this study was to compare the efficacy of smear layer removal by 5% chlorine dioxide and 15% Ethylenediamine Tetra-Acetic Acid plus Cetavlon (EDTAC) from the human root canal dentin. Materials >and Methods : Fifty single rooted human mandibular anterior teeth were divided into two groups of 20 teeth each and control group of 10 teeth. The root canals were prepared till F3 protaper and initially irrigated with 2% Sodium hypochlorite followed by 1 min irrigation with 15% EDTAC or 5% Chlorine dioxide respectively. The control group was irrigated with saline. 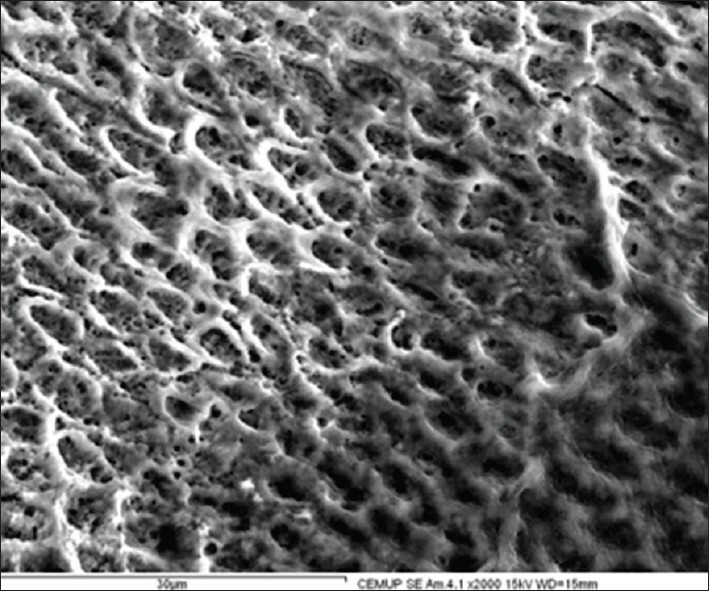 The teeth were longitudinally split and observed under Scanning electron microscope SEM (×2000). Statistical Analysis Used: The statistical analysis was done using General Linear Mixed Model. Results : At the coronal thirds, no statistically significant difference was found between 15% EDTAC and 5% Chlorine dioxide in removing smear layer. In the middle and apical third region 15% EDTAC showed better smear layer removal ability than 5% Chlorine dioxide. Conclusion : Final irrigation with 15% EDTAC is superior to 5% chlorine dioxide in removing smear layer in the middle and apical third of radicular dentin. 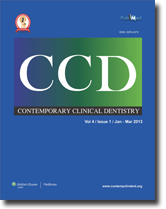 Background: Periodontitis has been reported to be associated with coronary artery disease. Research is needed to determine whether therapies that improve periodontal health also reduce systemic marker of inflammation associated with both diseases. Aim: To determine whether sub-antimicrobial dose-doxycycline (SDD) therapy can reduce systemic serum inflammatory biomarker C-reactive protein (CRP) in post-menopausal women who have chronic periodontitis. Settings and Design: The study randomly assigned 128 eligible post-menopausal women with chronic periodontitis to a 90-day, twice-daily regimen of SDD or placebo tablets evaluated for 2 years, as an adjunct to periodontal maintenance therapy. 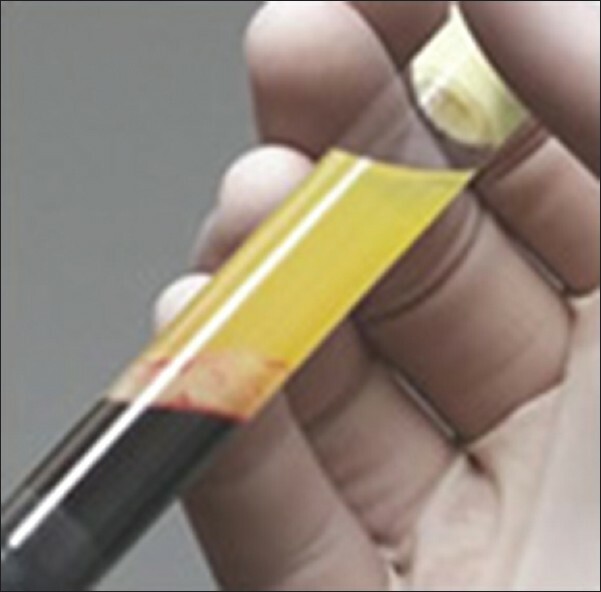 Materials and Methods: The study assayed blood samples for inflammatory mediators at baseline, 1 year, and 2 years. CRP was measured using a high-sensitivity enzyme-linked immunosorbent assay. Results: SDD treatment reduced median high-sensitivity CRP by 18% (primary outcome = 0.02). Conclusion: Ninety-day SDD regimen in post-menopausal women significantly reduced the serum inflammatory biomarker CRP over a 2-year period. Restricted mouth opening is a definite prosthodontic hindrance to carry out treatment successfully. Restricted mouth opening can be due to many reasons such as microstomia, oral submucous fibrosis, some genetic disorder, and as a result of some surgical treatment. 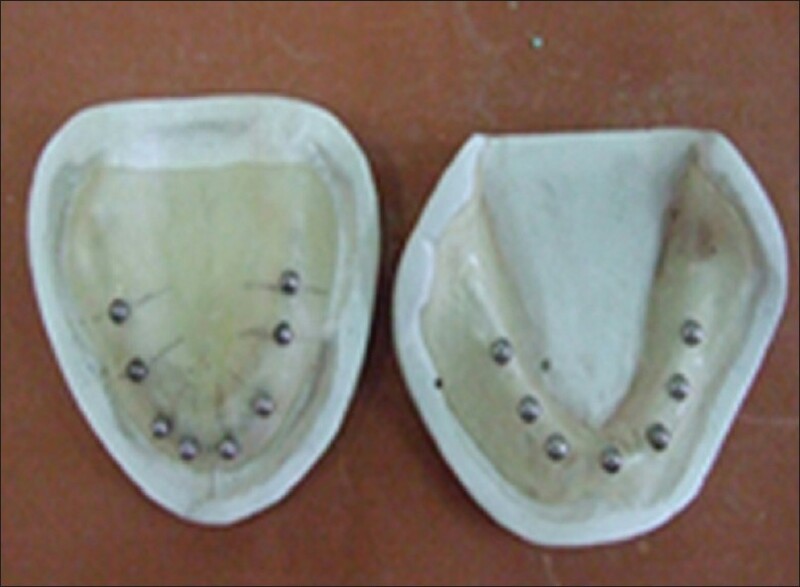 In the past, various techniques for prosthetic rehabilitation of limited oral opening have been tried such as surgeries, use of dynamic opening devices, magnetic devices, and modification of denture design. Here we present; a simplified technique and simple design for fabrication of maxillary hinged and mandibular hinged and sectional complete denture for a patient with restricted mouth opening due to oral submucous fibrosis. Giant sialoliths are classified as those exceeding 15 mm in any one dimension. Although, large sialoliths have been described in the body of salivary glands, they are rarely found in the salivary ducts, particularly when the patients have no painful symptoms. Sialolithiasis is one of the most common diseases of the salivary glands in middle-aged patients and approximately 80% of all reported cases of sialoliths occur in the submandibular gland. Here, we report two cases of giant sialolith of submandibular gland duct. Interestingly, sialolith found in one of our cases had an unusual similarity with the canine tooth and mimicking it in both size and shape. 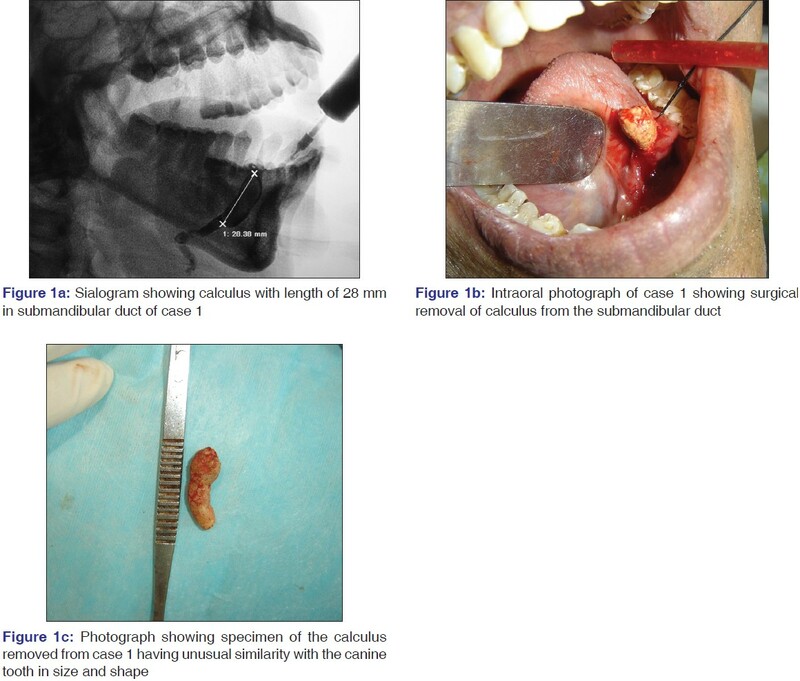 In both cases the calculus was removed surgically via intraoral approach. No recurrence was seen in any of the cases on follow-up. Injuries to the face are far more uncommon than other injuries in children. However, when they occur they can pose considerable management challenges to concerned specialists and the subsequent functional and esthetic impact to the growing child can be overwhelming. Here is a report of a 5-year-old girl diagnosed with fracture of the body of the mandible and an associated fracture of the parasymphysis. This paper presents a unique treatment modality considering the various anatomic and developmental factors in such young children. Trauma resulting in crown-root fracture is one of the most challenging fracture types. However, biologic width involvement should be carefully evaluated. Reattachment of tooth fragment to a fractured tooth remains as the treatment of choice because of its simplicity, natural esthetics, and conservation of tooth structure. The reattachment procedure using composite resin should be considered if the subgingival fracture can be exposed to provide isolation. 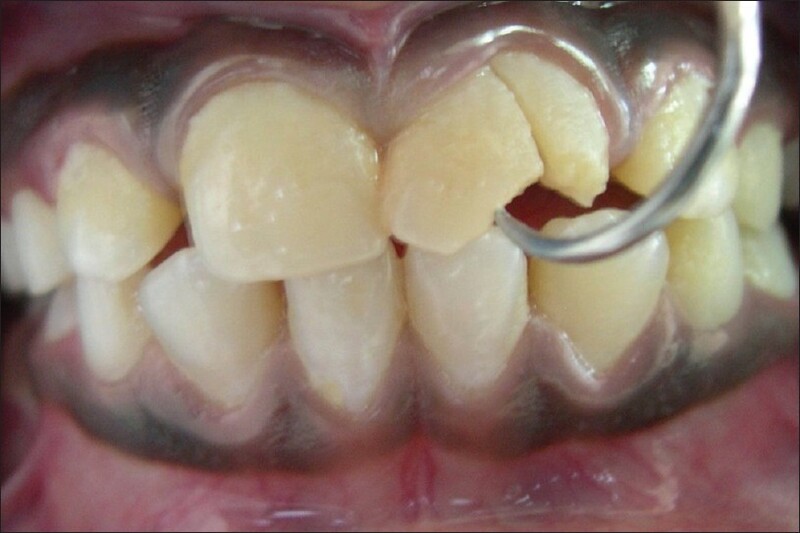 This report presents a case of complicated crown-root fracture of permanent maxillay left central incisor, involving the biologic width in a 10-year-old girl. The traumatized tooth was treated endodontically. Access to the subgingival margins was gained by orthodontic extrusion followed by gingivectomy. The fractured fragment was reattached using bonding system and composite resin. 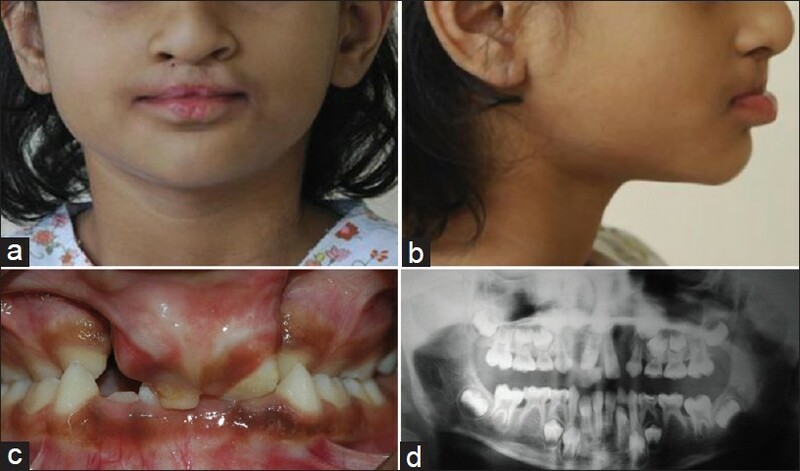 Cherubism is a rare, self-limiting disease that usually affects jaws of pediatric population and is characterized by diffuse, bilateral and multilocular bony enlargement of jaws with a typical radiographic and histopathological appearance. Here, we describe a case of an 8-year-old child without any family history of this genetic disorder. Various treatment options are available for rehabilitating the complete edentulous patients with implants. However, due consideration for the prosthesis is not given prior to implant surgery. This can result in implant being placed in locations that do not provide the best esthetic and functional result. Incorrect implant localization and angle are the primary cause of non-axial loading and may contribute to loss of Osseo-integration. For predictable outcome, the treatment should begin with visualizing the end result. A step-wise pre-implant surgery evaluation is necessary to achieve the objectives. This is a case report of a completely edentulous patient who was treated with fixed implant prosthesis following various steps in the pre-implant surgery evaluation. Odontogenesis is a complex process wherein more than 200 genes are known to play a significant role in tooth development. An imbalance can lead to an abnormality in the number, size, shape or structure of the developing tooth/teeth. The presence of an extra dental lamina forms a supernumerary tooth. The supernumerary teeth are of two types: A rudimentary tooth where the supernumerary tooth does not resemble any tooth in the normal series or a supplemental tooth in which this anomalous tooth resembles one in the normal series. It is also very rare to encounter triple teeth in primary dentition. The union of these teeth may be through fusion, gemination, concrescence or a combination of fusion and gemination. Presented is a rare case of concrescence involving maxillary deciduous incisors and a supplemental tooth in a 7-year-old boy. The differential diagnosis, etiology, and complications of primary anterior triple teeth are discussed. Histoplasmosis is a world-wide distributed deep mycosis caused by Histoplasma capsulatum which has been endemic in many countries. We present a case involving an immunocompetent man evidencing the necessity of a multidisciplinary approach and rational requisition of exams. The disease has started as a pulmonary disease mimicking tuberculosis, although the exams have been negative. Immunodiffusion test indicate histoplasmosis, not confirmed by culture of sputum. After days the patient was forwarded by a private doctor for evaluation of oral lesions at our Department of Stomatology. An incisional biopsy revealed a nonspecific granulomatous inflammation and the Grocott-Gomori methenamine silver stain identified scarce oval structures that could represent fungal yeast. 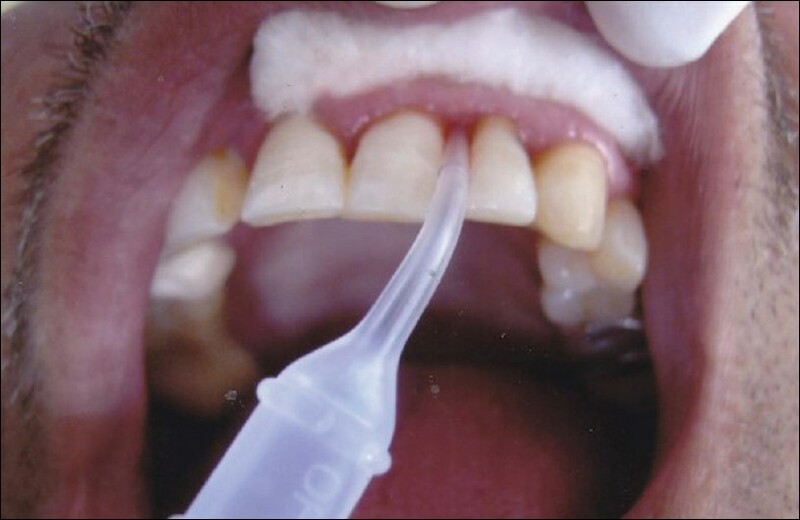 Sampling oral lesions with swab, it was observed the typical growth of H. capsulatum on culture. This case highlights the importance of doctor's integration diagnosing histoplasmosis, while a wide spectrum of clinical manifestations should be expected. Oral lesions may be the critical manifestation leading diagnosis. Idiopathic gingival fibromatosisis, a condition of undetermined cause can develop as an isolated disorder, but mostly it is associated with some syndrome. It usually begins at the time of eruption of permanent teeth but can develop with the eruption of deciduous dentition and rarely present at birth. 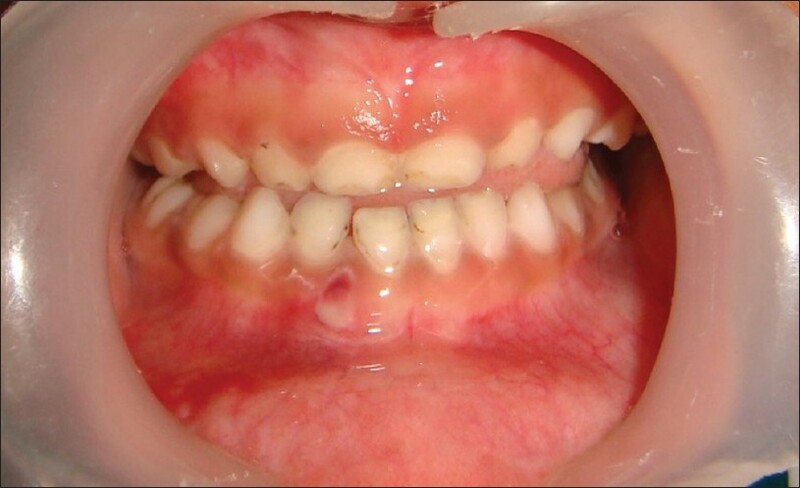 This case report describes an unusual case of non-syndromic generalized idiopathic gingival fibromatosis in a 15-year-old male present since birth. Surgical treatment in the form of ledge and wedge procedure with internal bevel gingivectomy was performed. No recurrence of enlargement was seen after 2 years of follow-up. 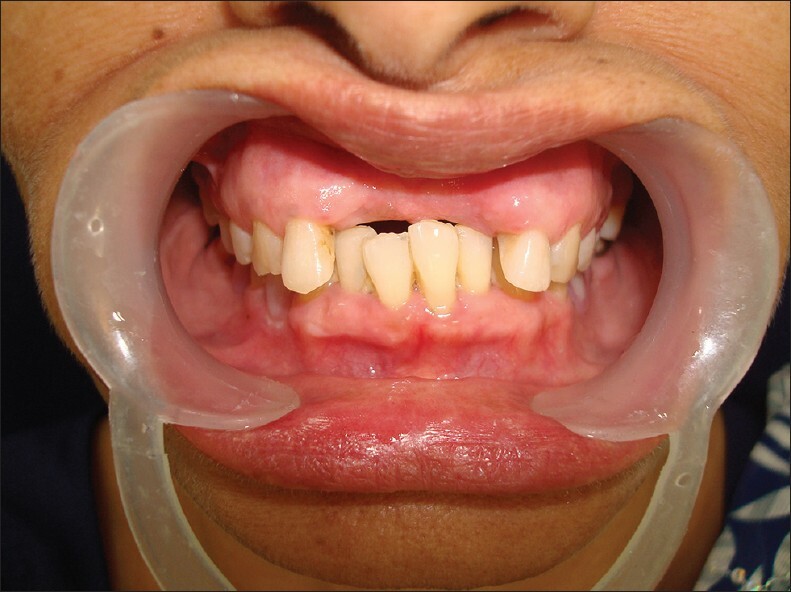 This article presents the case of a patient with Van der Woude syndrome treated with orthodontic and orthopedic intervention in the mixed dentition stage. 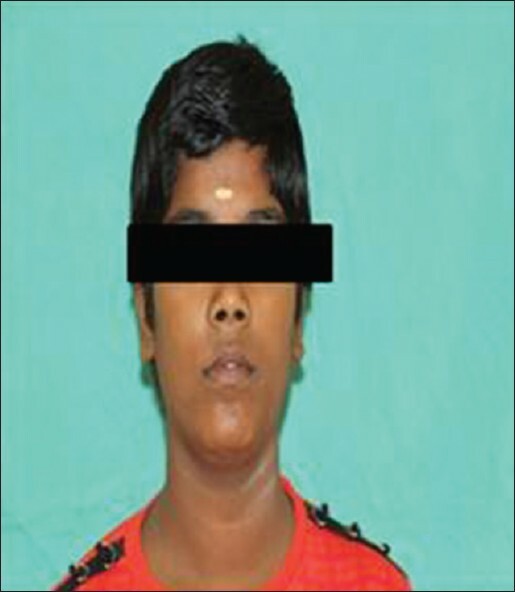 The patient had a bilateral cleft of the lip and alveolus accompanied by lip pits on the lower lip. Intra-orally, there was bilateral anterior and posterior cross-bite with a collapsed maxilla. The maxillary transverse deficiency was managed with orthopedic expansion and the second phase of treatment involved secondary alveolar bone grafting followed by retention with functional regulator-3. 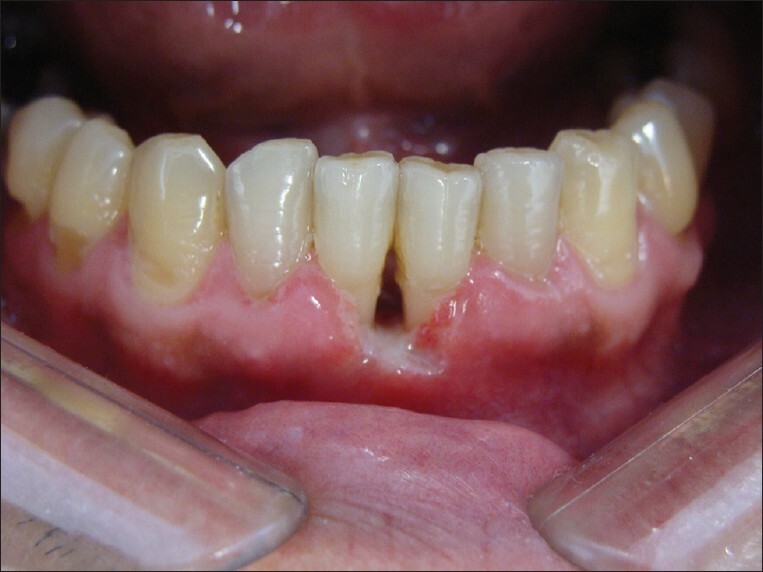 The mild maxillary retrognathia and deficient lip support was managed with dental compensation. The calcifying odontogenic cyst (COC) is reported to be associated with odontoma in 24% of cases. Separation of the cases of calcifying odontogenic cyst associated with odontoma (COCaO) may lead to a better understanding of the pathogenesis of this lesion. The literature revealed 52 cases of COCaO. The male to female ratio was 1:1.9, with a mean age of 16 years. Most common location was the maxilla (61.5%). The radiographic appearance of most cases (80.5%) was a well-defined, mixed radiolucent-radiopaque lesion. Histologically, the lesions consisted of a single large cyst with tooth-like structures as an integral part, giving the impression of a single lesion. In addition to the unique histologic features, differences in gender and distribution were found between the cases of COCaO and those of simple COC. COCaO may be regarded as a separate entity and classified as a benign, mixed odontogenic tumor. The term odontocalcifying odontogenic cyst is suggested. Patients with a missing tooth along with diastema have limited treatment options to restore the edentulous space. The use of a conventional fixed partial denture (FPD) to replace the missing tooth may result in too wide anterior teeth leading to poor esthetics. The diastema resulting from the missing central incisors can be managed with implant-supported prosthesis or FPD with loop connectors. 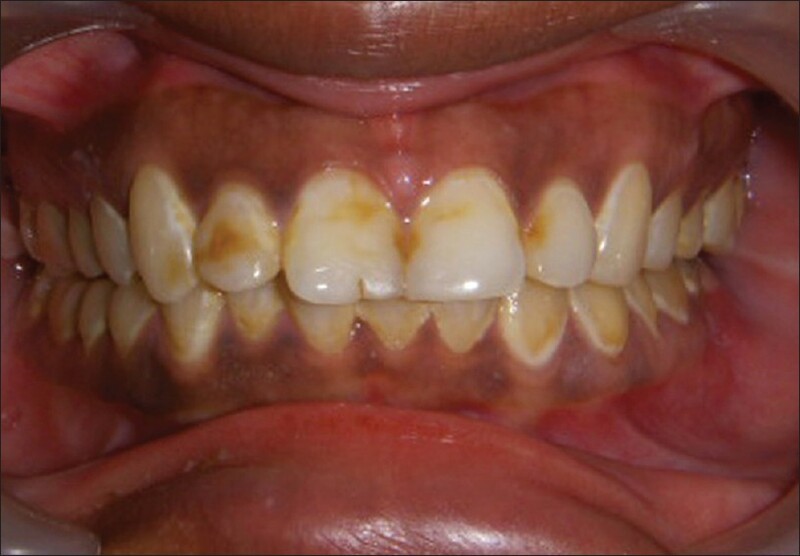 An old lady reported with chief complaints of missing upper anterior teeth due to trauma. Her past dental history revealed that she was having generalized spacing between her upper anterior teeth. Considering her esthetic requirement of maintaining the diastema between 12, 11, 22, and 21, the treatment option of 06 units porcelain fused to metal FPD from canine to canine with intermittent loop connectors between 21, 22, 11, 12 was planned. Connectors basically link different parts of FPDs. The modified FPD with loop connectors enhanced the natural appearance of the restoration, maintained the diastemas and the proper emergence profile, and preserve the remaining tooth structure of abutment teeth. This clinical report discussed a method for fabrication of a modified FPD with loop connectors to restore the wide span created by missing central incisors. Fracture of the styloid process (SP) of temporal bone is an uncommon injuries. Fracture of the SP can be associated with the facial injuries including mandible fracture. However, injury to the SP may be concealed and missed diagnosis may lead to the improper or various unnecessary treatments. 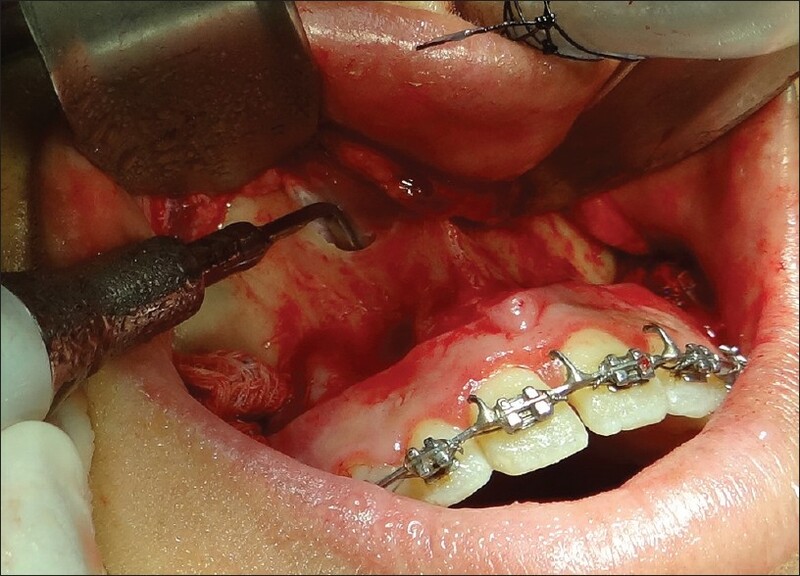 A rare case of SP fracture associated with the ipsilateral mandibular fracture and also the diagnostic and management considerations of the SP fracture are discussed. 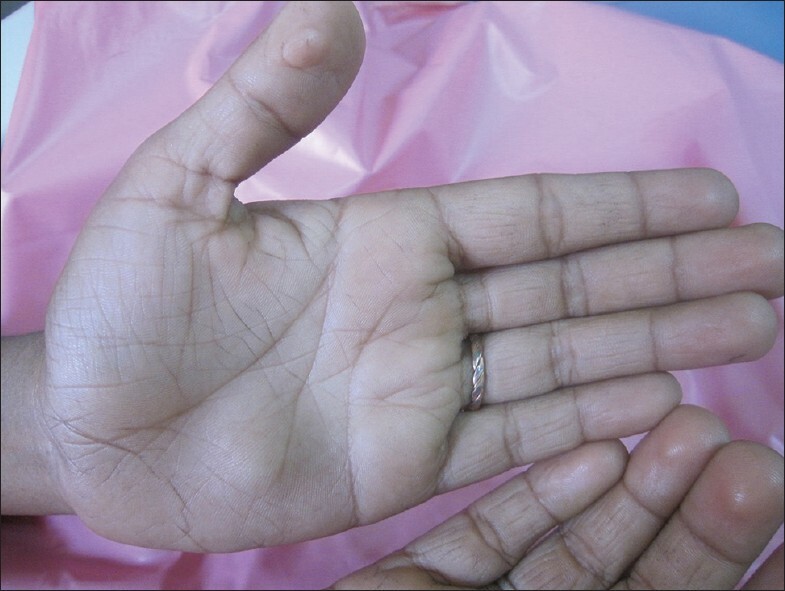 Cowden syndrome (CS) or multiple hamartoma syndrome is an infrequent genodermatoses, which is inherited as an autosomal dominant trait resulting from the mutation in the Phosphatase and Tensin homolog gene on the arm 10q and is principally characterized by multiple hamartomas with an increased risk of development of malignancies. Facial and oral signs are remarkable in the form of multiple papules and trichilemmomas on the face. We report one such rare case of CS in a 19-year-old patient who was diagnosed on the basis of her oral mucosal lesions and was further investigated and diagnosed with other hamartomas. The present case report signifies the responsibility of the oral physician in the early diagnosis of this progressive pathological syndrome as it leaves its footmark in the oral cavity in the form of oral mucosal lesions. The common man is bombarded by the media extolling the virtues of "the perfect smile." In the 21 st century of esthetic dentistry, fractured, malformed, malposed, and discolored teeth can be changed and restored to highly desirable form due to introduction of wide range of esthetic materials and techniques. Porcelain veneers is a conservative method of restoring the appearance of discolored, pitted teeth, and teeth with diastemas that provide extremely good esthetic results. A 21-year-old female patient with staining in anterior teeth had reported to the Department of Prosthodontics for esthetic rehabilitation. The patient was treated with porcelain veneers on maxillary anterior teeth. The patient was satisfied with the enhanced esthetic appearance. In maxillary Le Fort I type osteotomy the detachment of the nasal mucosa should be done carefully. Piezoelectric surgery contributed much to increase the safety of osteotomies, despite the initial advantage of minimizing the risk of injury in nervous tissue, mainly in bilateral sagittal split osteotomy; we use the piezoelectric device for the initial detachment of the nasal mucosa in the maxillary osteotomy.